Beach Flats gardener Don Emilio Martinez Castañeda marches from the garden to City Hall. Photo by Calyse Tobias. 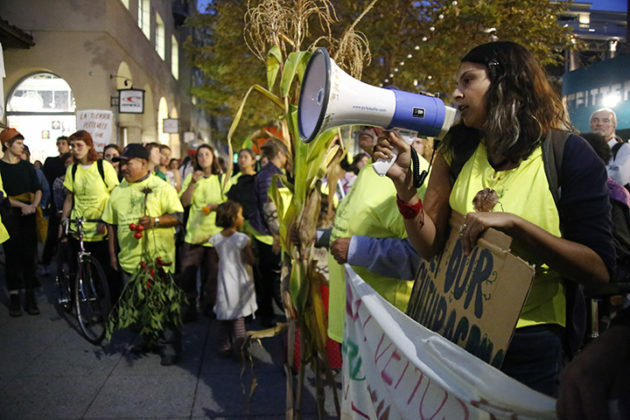 The march stopped downtown as people gathered close to hear leaders speak about how the march was lending emotional support to the gardeners before they spoke in front of city council members. Photo by Calyse Tobias. Community members help to draw signs for the Beach Flats march. Photo by Calyse Tobias. 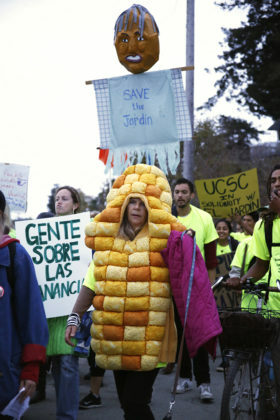 Marchers were dressed in garden-themed attire, from corn husk hats to various fruit costumes. Photo by Calyse Tobias. 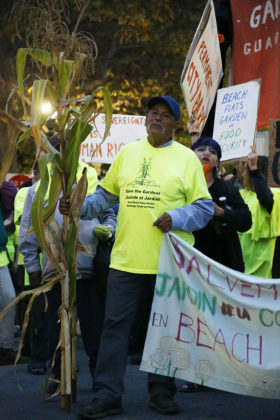 With fresh produce from the garden in hand, over 100 people took to the streets to peacefully march in support of keeping the entirety of the community garden intact. Photo by Calyse Tobias. One of the co-founders of the garden, Gia Dent, recalled a time 23 years ago when the garden didn’t exist. The Santa Cruz Seaside Company owns the Beach Flats garden property, which is about half an acre in size. For the past 25 years in which the land has been on loan to the gardeners, the garden has fed residents of the Beach Flats with sustainably-grown produce like corn, beans and other crops. Since many of the residents can’t afford the organic food sold in Santa Cruz, the garden has been a public resource for those of low-income backgrounds. The public hearings began when Seaside Company’s spokesperson Kris Reyes offered to allow the Beach Flats community to keep two-thirds of the garden and extend the lease by three years. After hearing from garden supporters and Beach Flats residents, Santa Cruz City Council members voted unanimously to accept the lease offered and pursue further negotiations with Seaside to keep the entire garden and establish a permanent space. To settle the differences between the two parties, the City of Santa Cruz will attempt to purchase the property from the company and locate possible funding sources. 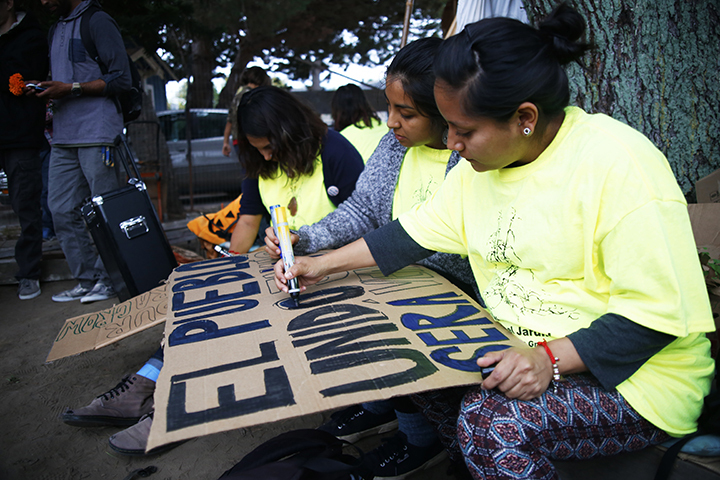 The rally began in the garden around 5 p.m. when gardeners, other Beach Flats residents and supporters clapped to the chanting of “Si se puede.” Irene O’Connell, one of the march’s organizers and a staff member at the Resource Center for Nonviolence, announced the plan for the evening. 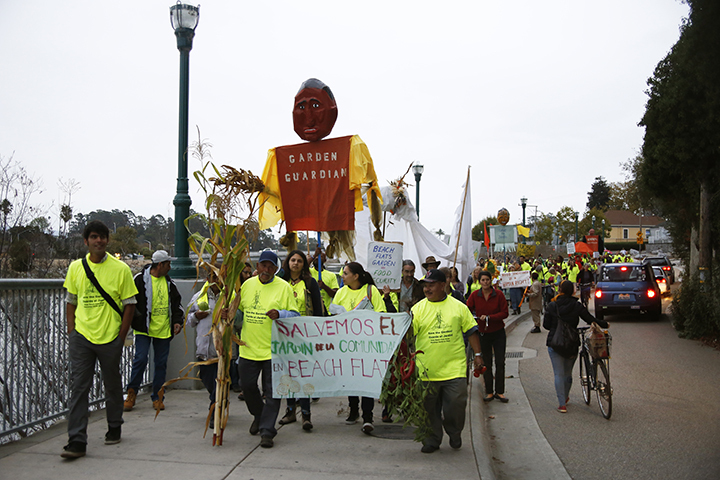 The group moved to the corner of Cooper St. and Pacific Ave., where gardeners and community members gave testimonials and gathered more support before making their way to Santa Cruz City Hall. Farmers, children, UCSC professors and community activists gave personal accounts of the garden’s significance, which made for an emotional atmosphere in City Hall. In a plea to save the garden, the farmers and Beach Flats residents appealed to the cultural value of the space. “The cultivation and preservation of our culture — I see that as the main reason … why the garden is important to us,” said organizer Carolina Morales Ceseño. Ceseño spoke to City Council, stressing the significance of the garden to farmers and Latin@ immigrants. The community demanded that it remain permanently open to enable the provisions of healthy and sustainable food. The location also secures jobs of the farmers, and maintains a safe gathering place that has cultural value to local Santa Cruz residents.